There were so many things to account for: 220V electricity in Lebanon, different size of wall switch and box compared to US, 908.4 MHz Z-Wave on my smart hub (US frequency), compatibility with SmartThings and Google Home, I didn't want an additional hub hanging off my router, and best of all: super frequent electricity cuts and blackouts. 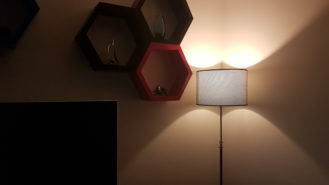 Smart wall switches, while more practical than smart lights usually, were out of the question the moment I realized that finding the right size, wiring, and voltage was near impossible. Z-Wave lamps with the appropriate frequency (US) and power (EU) for my situation don't exist as far as I can tell. I looked into 220V Zigbee lamps but didn't find any that convinced me back then. 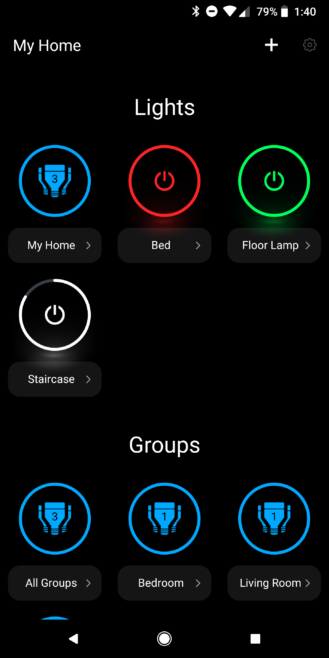 And Philips Hue was out of the question because of its use of a separate hub (I know you can use them without, but you don't get updates) and the fact that it didn't retain its state after a power cut. 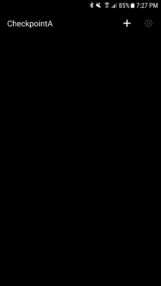 The idea of a dim room going to 100% brightness in a second was not appealing at all. 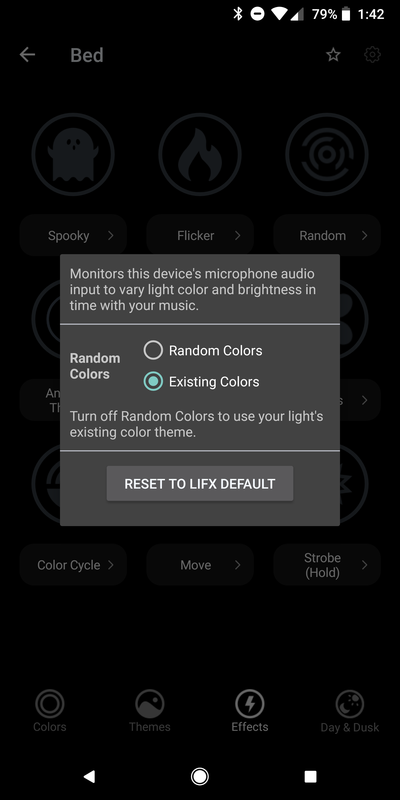 So that's how I landed on LIFX. 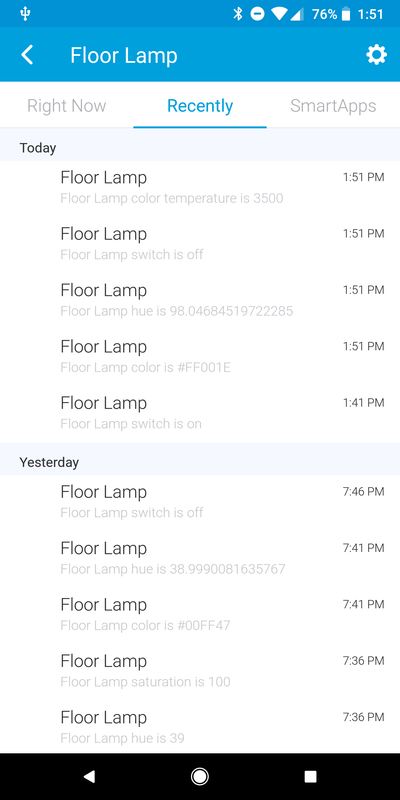 For my use case, the company's WiFi bulbs were the perfect solution. 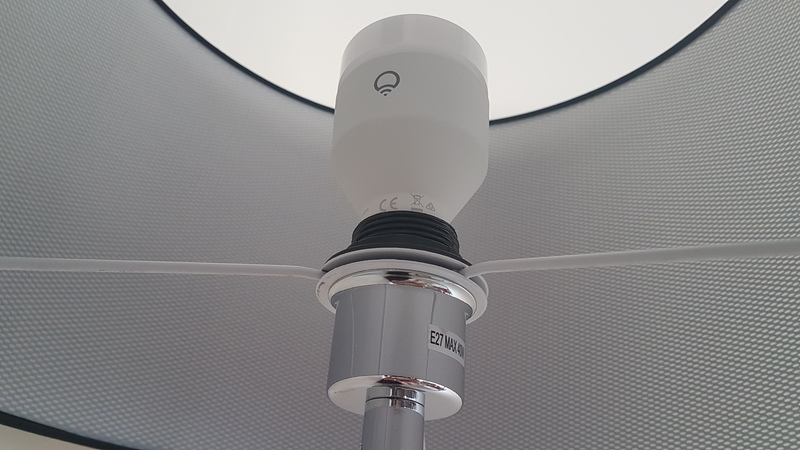 No hub, no Z-Wave frequency to worry about, plenty of clear sizes and screw types and voltages to choose from, and best of all, they retain their state after a power cut. 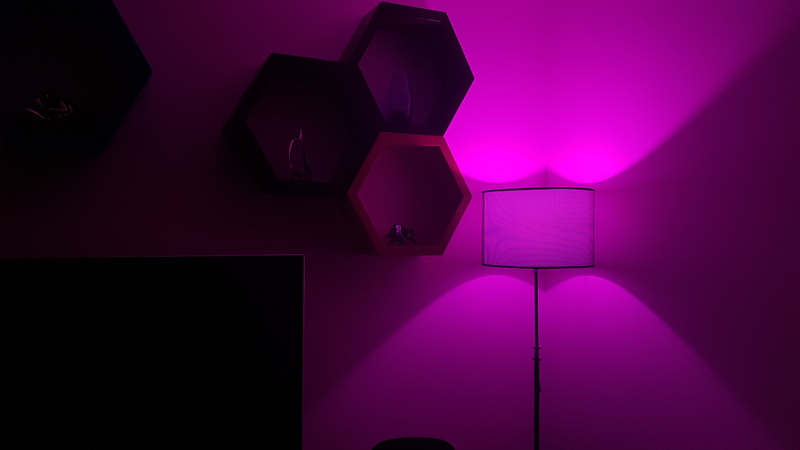 I didn't jump in too deep with LIFX though. There are 13 embedded ceiling lights in my living room alone. 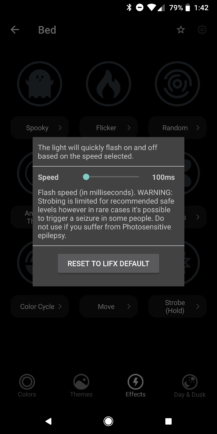 At the price LIFX sells its products, this would require a fortune. Instead, I got 2 A60 (A19) lights, one colored for the corner mood lamp in the living room and one LIFX+ (with night vision) for the outside stairwell. 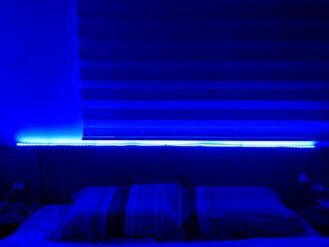 I also got a LIFX Z LED strip that should go in the home bar we'll soon be installing, but for now it resides in the bedroom. Overall, I think I made the right decision, but it didn't come without hiccups. 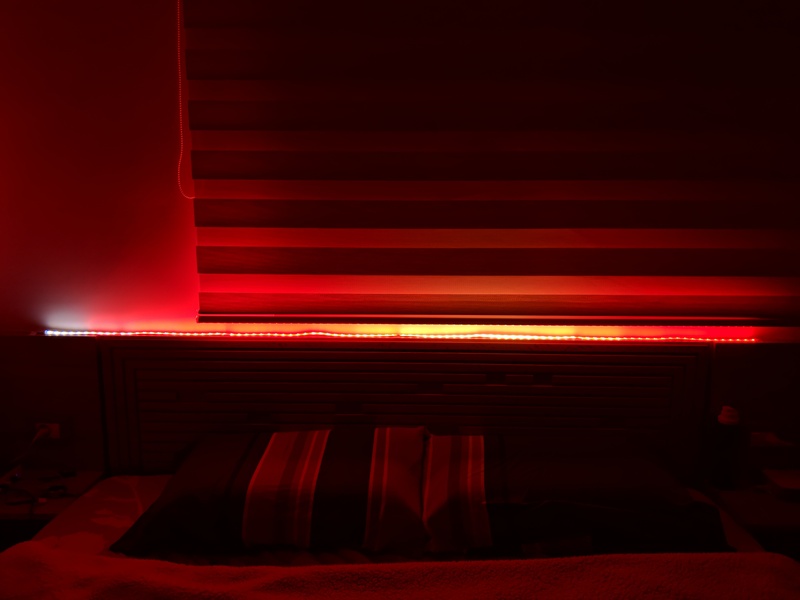 Brightness and colors The LIFX bulbs go up to 1100 lumens, the strip with 2m reaches 1400 lumens, and they cover every color you can think of with accuracy and vibrancy. Outdoor use You can install the regular or + light bulbs (not the strip though) outdoor in a fixture that doesn't get direct rain or in the bathroom. 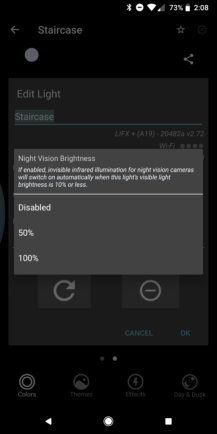 Night vision It does work on the LIFX+ and can add IR to your cam if it doesn't have any or extend its existing IR night vision. WiFi connectivity No hubs or Z-Wave frequencies to worry about. Plug the light, connect it to the app, and it's good to go. 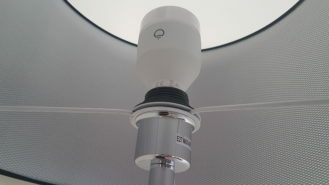 Voltage and screw compatibility LIFX makes different types of lights for several markets, including 110V and 220-240V, and taking into account Edison screws and Bayonet caps. Remembers state After a power cut, the light comes back on but to its last state, including color and brightness setting. 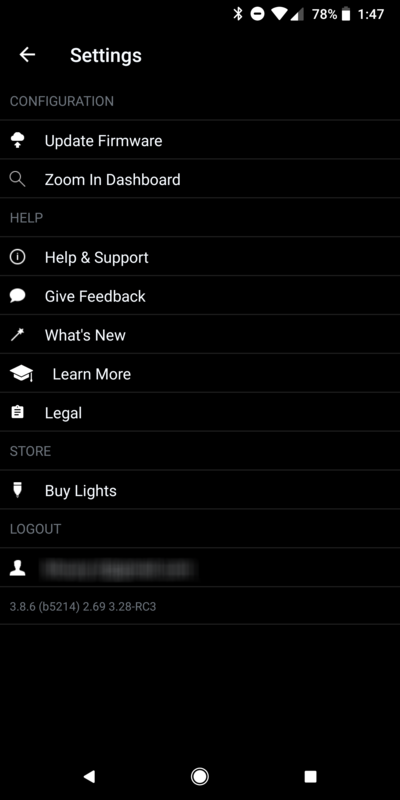 Options If you don't want all the bells and whistles, LIFX has cheaper Mini lights with only white or day and dusk (various temperatures of white) options. 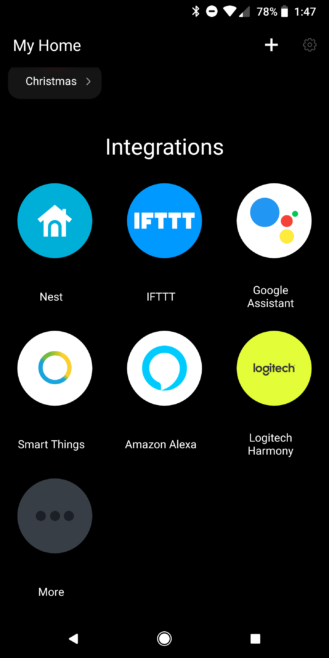 Plenty of integrations LIFX has an IFTTT channel and works natively with SmartThings, Google Home/Assistant, Alexa, HomeKit, and more. Price A single A19 bulb is $60 when not discounted. And bigger packs don't offer any savings. Yikes. 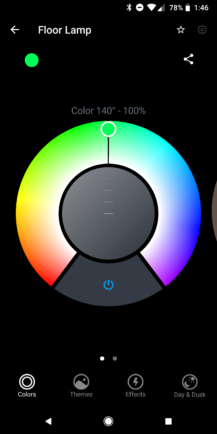 It gets worse for the LIFX+, LIFX Z, or the downlights. WiFi connectivity, again More devices on your network, more security risks, more potential disconnections. Switch-dependent If you turn off the wall or lamp switch, the light will be off and there's no way to turn it back on without manually flipping the switch. 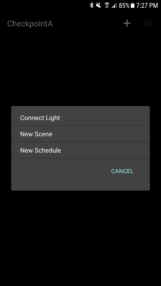 So much for smart The LIFX app lets you schedule lights and set scenes, but there are no timers and little control over themes and effects. Installing the LIFX lights was as easy as opening the box, taking the light out, and screwing it in the lamp. 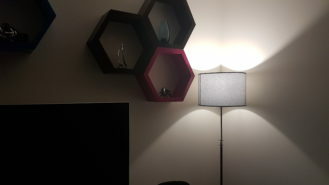 The bulb's size isn't too large and it easily fit inside my large corner lamp (below, left), but also inside the ceiling fixture at our doorstep (below, right) which holds another regular light. 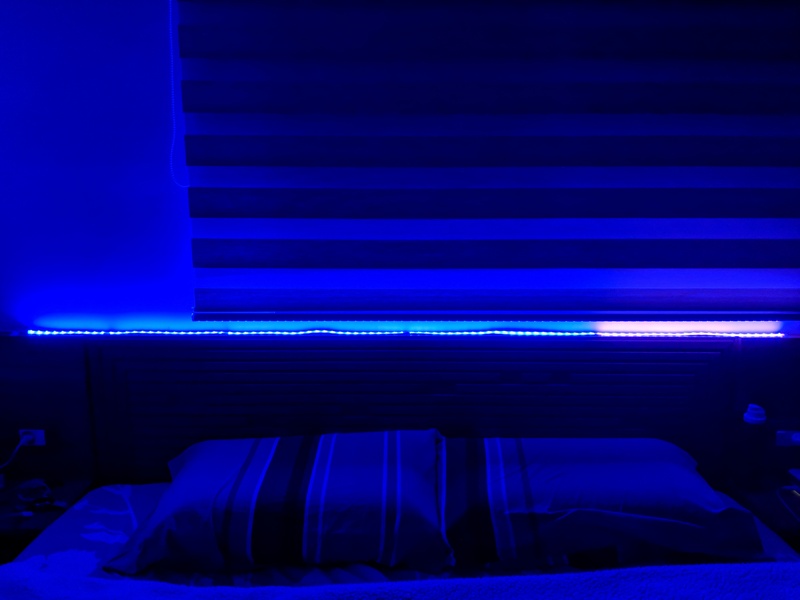 As for the LIFX Z LED strip, you choose the plug type you need (there are several in the box), connect it to the cable (2.5m total including the controller), then attach the LED strips. There are two 1m strips in the box and you can buy additional ones if you want. The moment you install or plug any of the lights, it turns on and gets ready to pair with your phone. 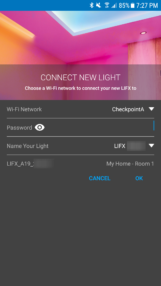 The LIFX app guides you through the process of finding a nearby light, connecting it to your WiFi network, giving it a name and room location, and updating it to the latest firmware. It takes about 3-5 minutes per light. 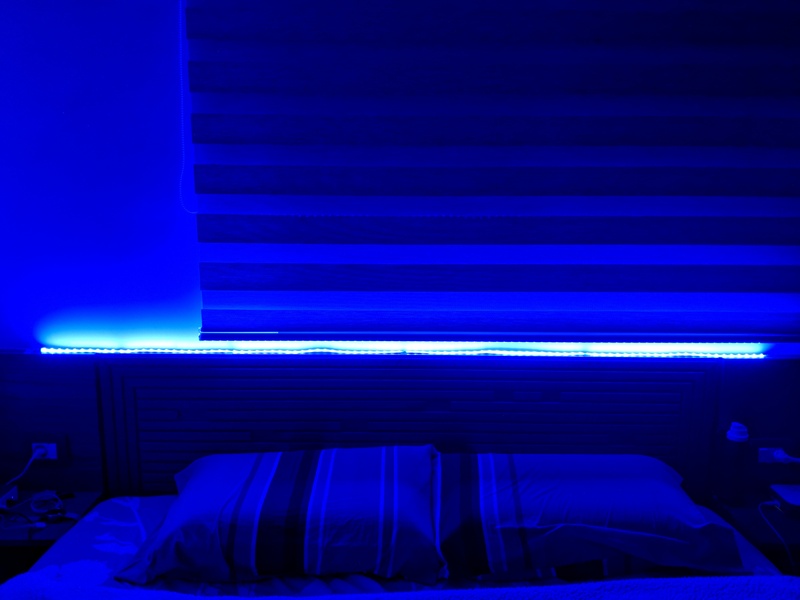 The lights both offer multiple white temperatures from 2500K to 9000K and a wide gamut of 16 million colors. The hardest part is settling on one: they all look really fantastic. I took the images below in my completely dark living room with my S7 Edge focused on the light to showcase its colors, but that exposure caused the entire room to look a lot dimmer than it was in person. Keep that in mind as you check the photos: the lights reach 1100 lumens so they're plenty bright in person, even with the mesh enveloping the floor lamp obstructing a bit of the brightness. Top: 2500K (left), 3500K (right). Bottom: 6000K (left), 9000K (right). Beside the whites, the rest of the colors are vibrant and gorgeous, especially at full brightness. Below, you'll find a collection of photos, also taken with an S7 Edge, covering different colors. 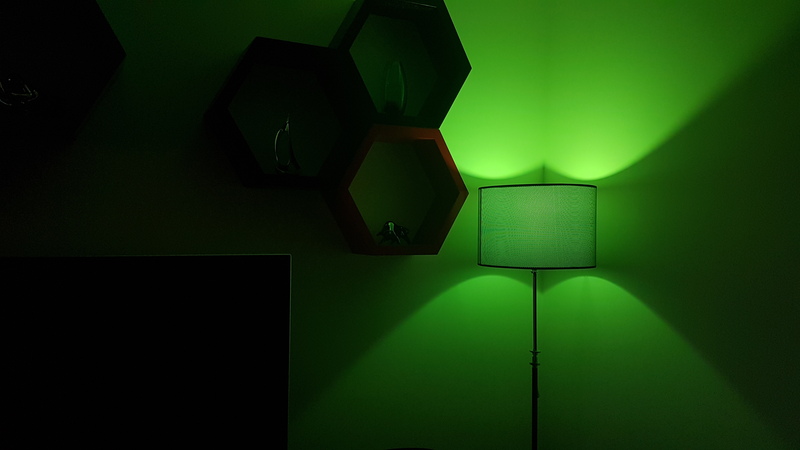 I'm especially a fan of the green, even if it doesn't fit with the rest of my quasi-CMYK living room setup. The blue and magenta work better from an aesthetical perspective, but my heart flutters when I set it to green. 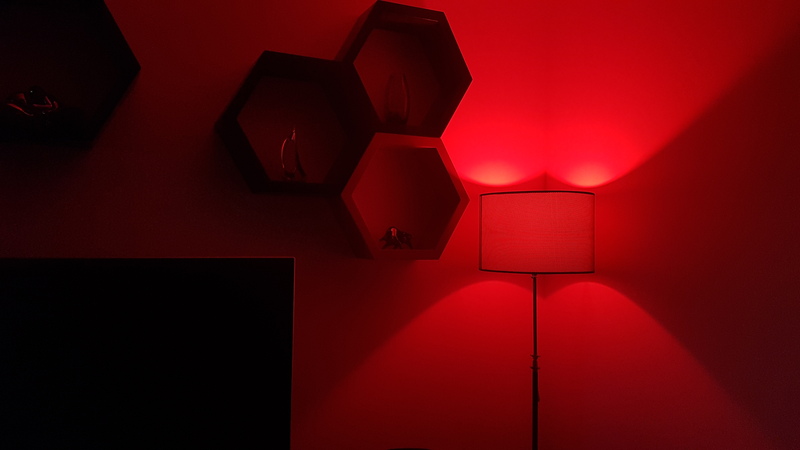 The LIFX Z LED strip proved just as good with color reproduction and brightness. Since I'll be moving it to the dining room home bar and don't plan on keeping it permanently in our bedroom, I didn't completely stick it to the bed board, I just used a few pieces of tape to hold it in place. That's why if you look closely you may see some waviness in the strip. 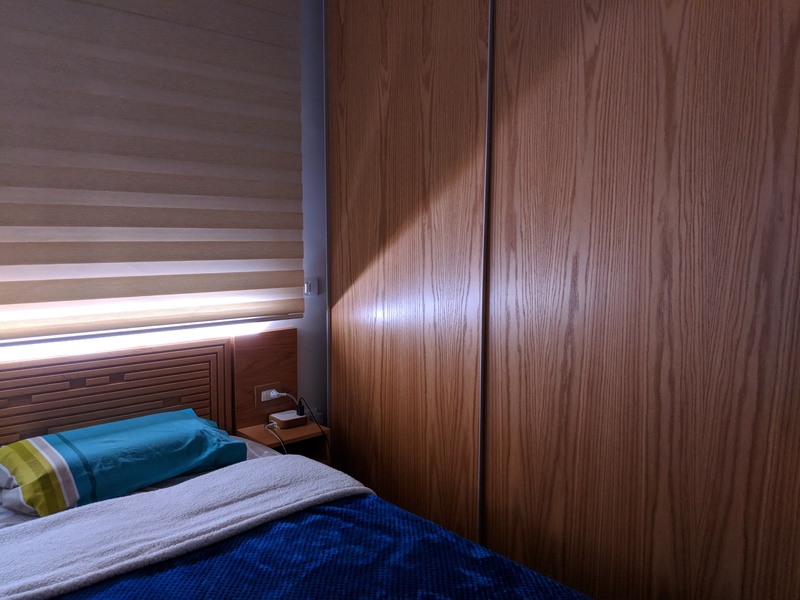 Also, as with the images above, these were taken on a Pixel 2 XL with focus on the light, so the room appears a lot dimmer than it is. With the white color on 100%, the Z strip can blanket the entire bedroom in light, even in super dark conditions and with the curtain dampening half of its effect. 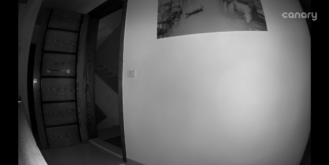 And finally, I tested the night vision aspect of the LIFX+ bulb. 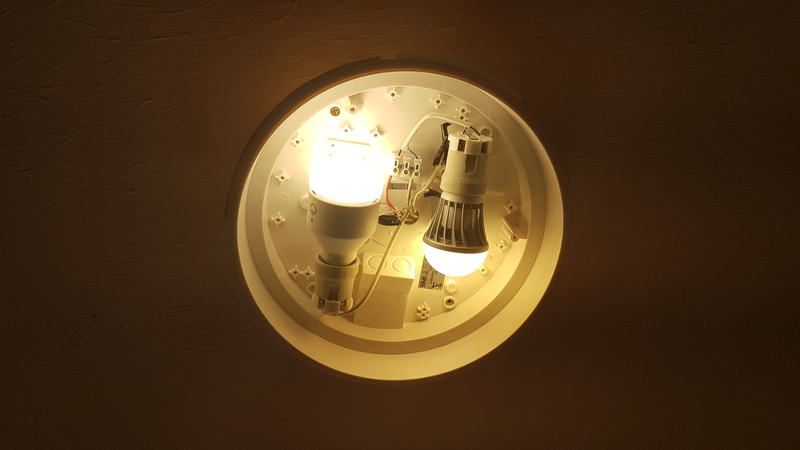 I installed it outdoor in the ceiling fixture in our stairwell near our door. My camera (I'm still with Canary, but only because I'm waiting for a good deal on the 1st gen Arlo Pro) sits inside the apartment and points to the main door, though at an angle that's obstructed from seeing the light bulb directly. I was curious to see if this would still give me a better IR vision at night. 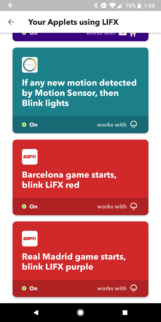 I started with Canary as it is, with its night vision working, and first kept the LIFX+' night vision off then turned it on. 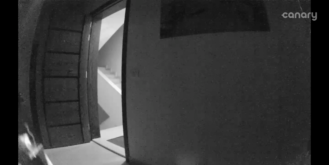 You can see that the outside staircase and even the area right outside the door are poorly seen by Canary's IR because it can't illuminate them from this angle, but the addition of LIFX brings more clarity to both. 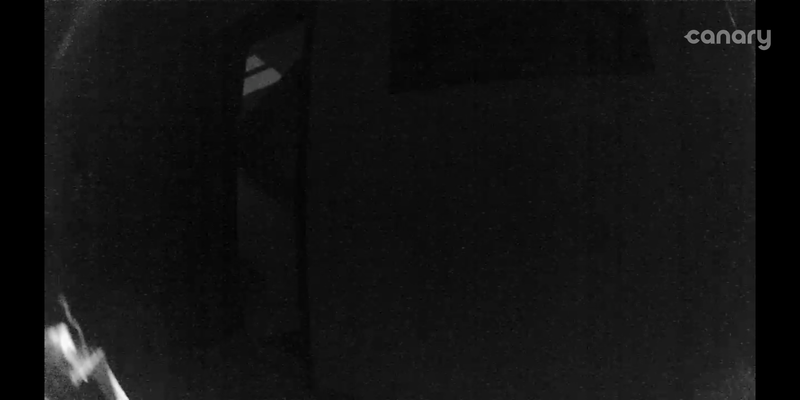 I then covered all of Canary's IR lights with thick black tape and tested the same thing, to emulate what a camera without night vision would see without and then with LIFX+'s night vision. It's clear how dark the entire room is when no IR is working and how the LIFX+'s night vision illuminates the outside area and even has a bit sneak through to the inside of the house. Neat. 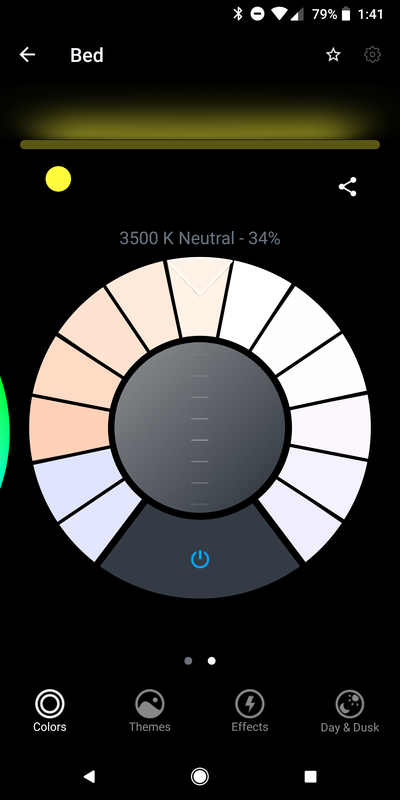 Beside static colors and brightness, LIFX offers two different ways to control your lights: Themes and Effects. Themes only make sense if you have several lights in the same room or vicinity, or if you have the LIFX Z strip. (You can assign a theme to one light, but that's just the same as choosing a color.) If we're talking about individual lights, a theme sets each light in a group to a different static color, but the group result is a pretty combination that suits different moods. If we're talking about the Z strip, a theme will assign different colors to varying sections of the strip, like in the images below. Effects work with a single light or a group. They're animations that change the color and brightness of a light according to a small set of rules. The funniest is the spooky effect, which flickers then switches to red. The most psychedelic is the strobe effect, which flashes the light on and off every 100 milliseconds. And the one I most often used is the random effect, which just cycles through various colors. 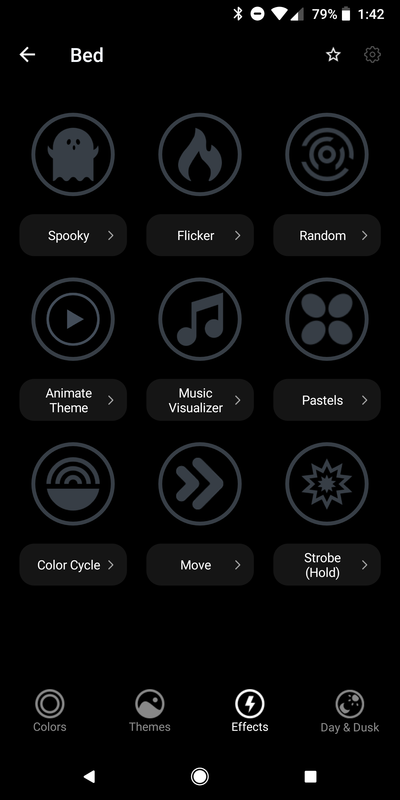 There's also a theme animation effect, a music visualizer that tries to match the lights to music playing (through your phone's microphone, I found it to be meh), and a moving color effect that's only available on the Z strip. Cheerful theme + Move effect on the LIFX Z. 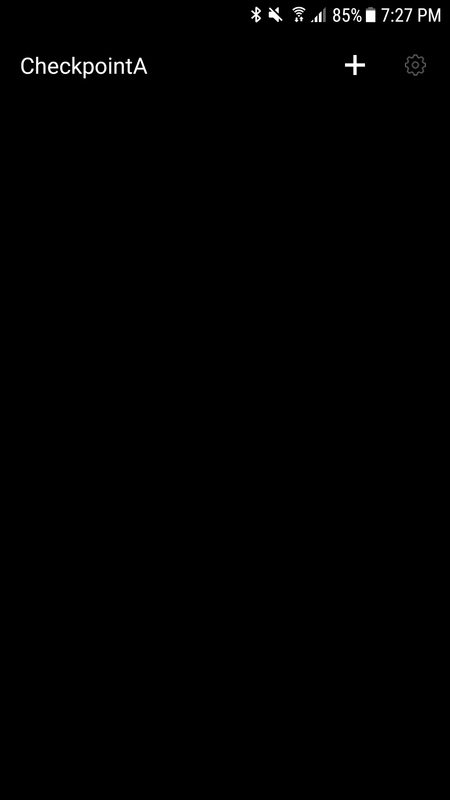 Below is a video of the random effect (despite the music playing, this is not the music visualizer). You can see the brightness and colors fade away and change almost every second. It's just fascinating to look at and I can spend minutes on end fixated on the colors. 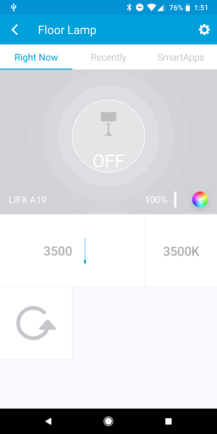 The LIFX app is where all of your lights' controls are. The main page has a list of your lights, groups, scenes, and schedules, plus all of the possible integrations with other smart home services and devices. At a quick glance, you can see if a light or group of lights is on, plus its color and brightness. You can also tap the big icons for each light or group to turn them on or off instantly. Tapping on the name below them, however, launches the more detailed controls for colors, themes, effects, and more. There aren't a lot of general settings. Essentially, you can update the lights' firmwares, get support or feedback, buy more lights, and log out of your account. 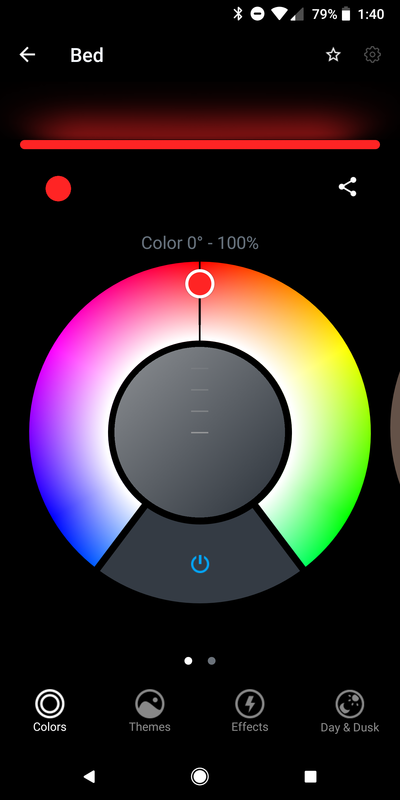 The LIFX app has a color wheel for choosing any color you want and a dial in the middle for changing the brightness. 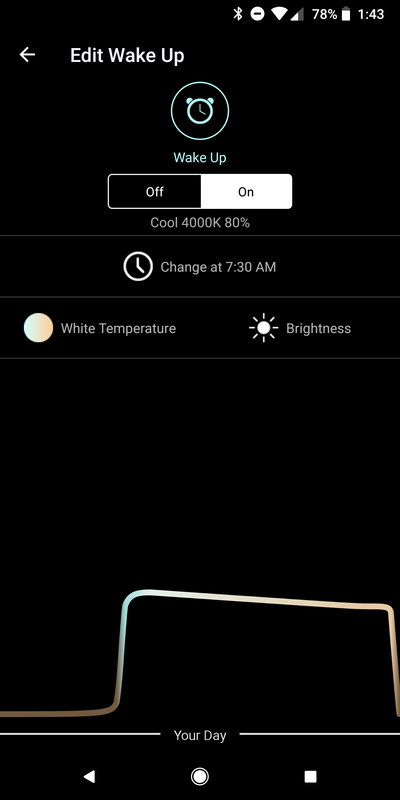 Swipe to the second screen and you'll see a different wheel for white temperatures. If you're controlling a Z strip, you'll see the entire strip on the top to showcase what exactly it'll look like. 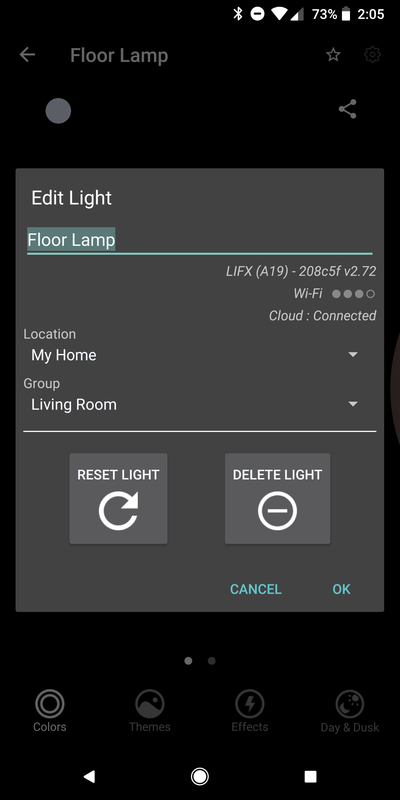 Tapping the setting gear (top right) of any light lets you change its name or reassign it to a different location or group. 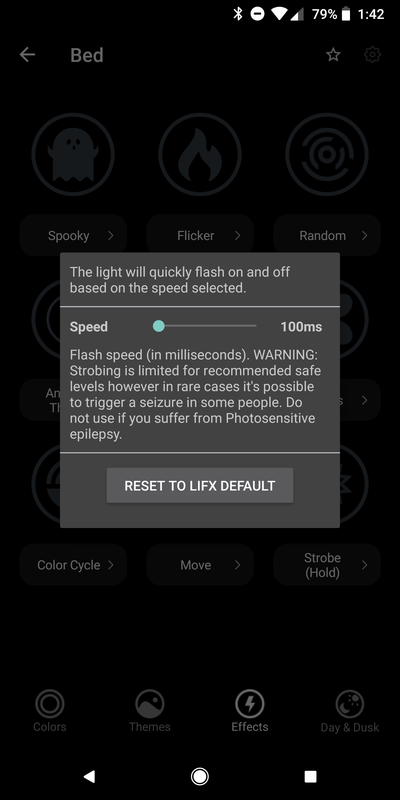 In the case of the LIFX+, it also lets you turn on the night vision and set it to 50% or 100%. There are several preset themes for each light or group of lights and tapping each one repeatedly cycles through different options for the same theme. I've been using the Santa theme on the Z strip over the past couple of weeks and it's been fun to dip the entire room in the Christmas spirit. At first I thought there was no way to specifically choose a color for different sections of the Z strip, but turns out you can drag and drop any of the 14 colors to the strip to create your own theme. It's clunky, not very precise, and you can only save that as a scene, not a new theme. Effects on the other hand are a lot more elaborate and each one has a separate set of controls for choosing the speed of the animation, brightness of the lights, and other variables specific to every effect. The thing I found myself missing is more control over themes and effects. I want to be able to choose exactly which colors to assign to each light in a theme. I want to have my lights only switch every 10 seconds between blue and magenta on the living room floor lamp, and for Christmas, I want it to go from red to green to gold. 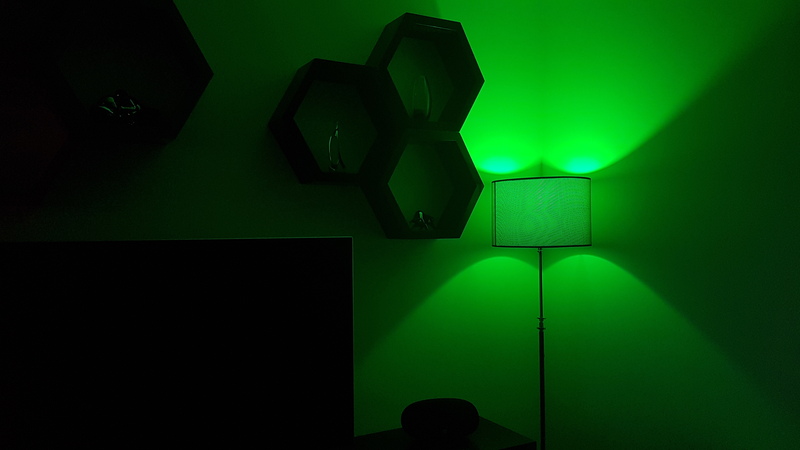 That'd be perfect, but it just isn't possible with the LIFX app. 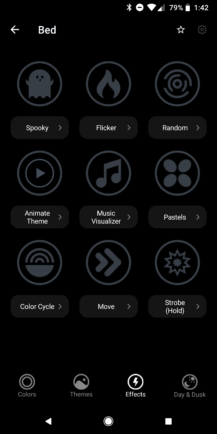 Themes and effects are preset and you can't add to them. 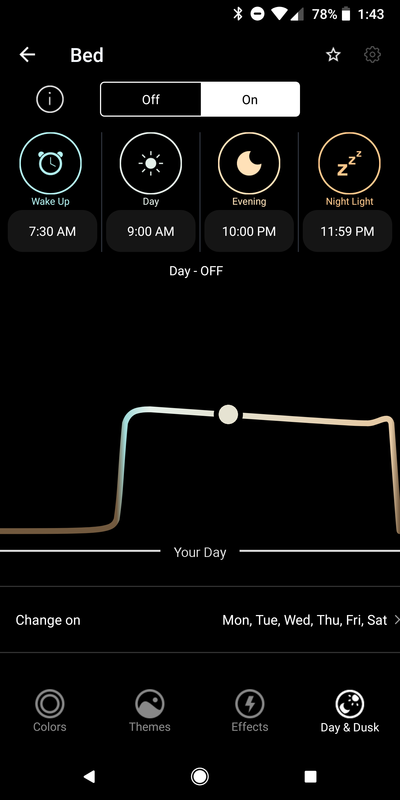 The last tab of light controls is the new Day & Dusk scheduler. 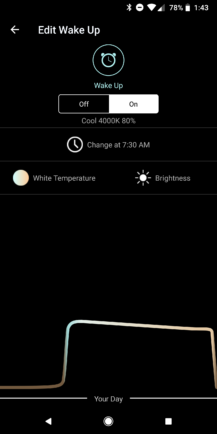 This lets you automatically change your lights' white temperature and brightness in 4 different chunks of the day: wake up, day, evening, and night light. 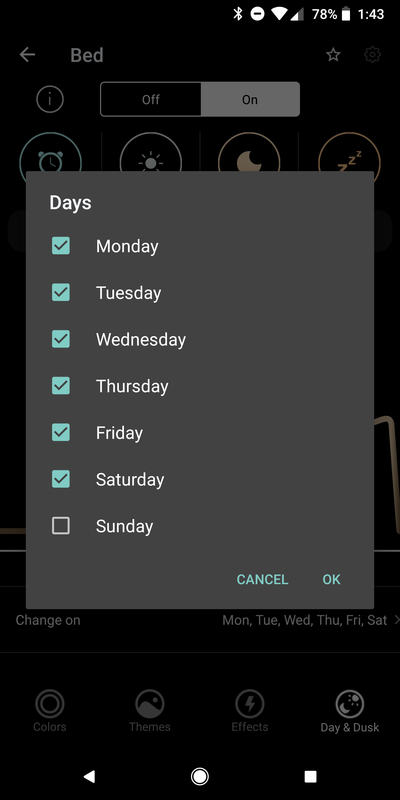 I tested it for a brief period of time in our bedroom but eventually turned it off for one reason: the schedule can only be repeated the same way everyday. 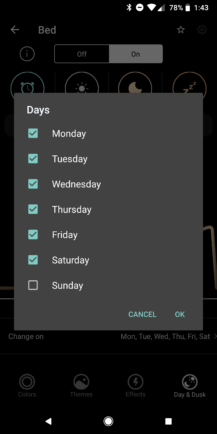 I'd like more control over the weekends: specifically, Saturday and Sunday mornings should be different from other days, and Friday and Saturday evenings as well. Once you find a certain setup around your house that you like, you can save it as a scene. 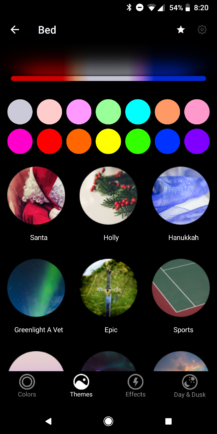 This memorizes the state, color, brightness, theme, and effect of every light you check and switches to that setup in one tap of a button, or in one voice command. Sadly, once a scene is set, there's no way to know exactly what each light's color and brightness are, only whether they're on or off. That makes editing the scene very limited unless you create a new one. 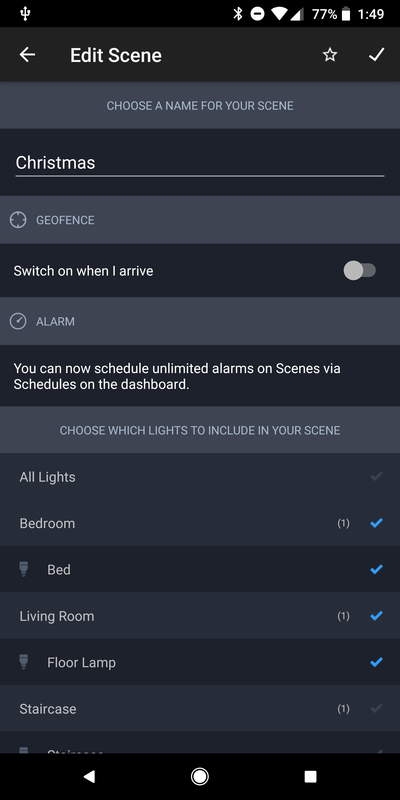 You can also automate some/all lights with schedules, which can execute any color/brightness or any scene at a specific time. These came in super handy with our electricity cuts. Since I don't want the lights to turn super bright if the power toggles at night, I set all the lights to switch to 5% brightness without changing their state at 11pm each day. That way, even if the power triggers them on, they'll only be at 5%. I could have had them at 1% but that'd be invisible and I might later miss that they're on to begin with. 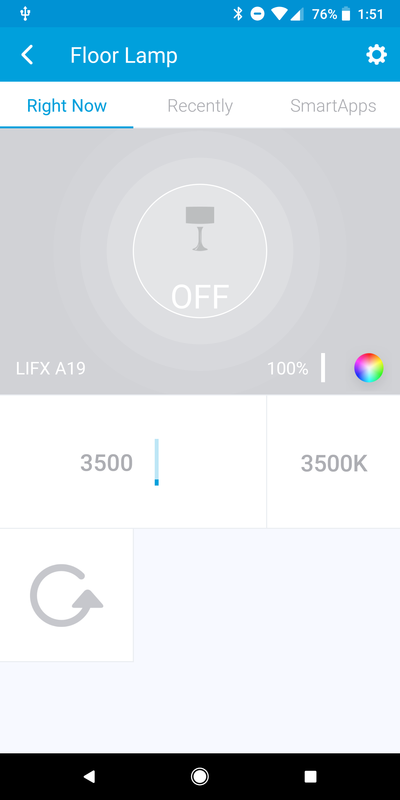 However, I am still a little shocked that there's no timer inside the LIFX app. You can schedule anything to go on or off at any time, but you can't set a light to go off after 2 minutes of being on. 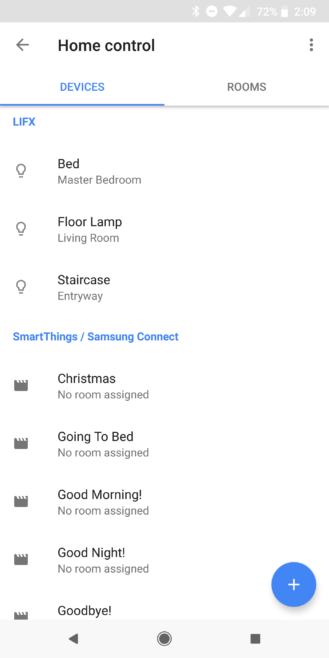 That required an entire hour of research and a deep dive into SmartThings custom Smart Apps to get it working (I'll get to that later). A timer is just a basic feature and would be great for lights you only need momentarily like a porch/doorstep or a bathroom/closet light. 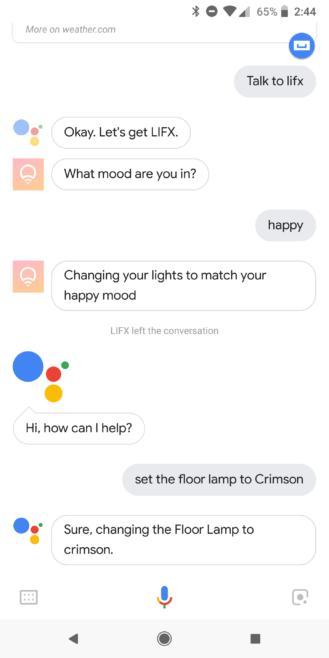 Google Home and Assistant have two different integrations with LIFX. The main one, under the Home Control section, adds your lights natively and lets you control them without "ask(ing) LIFX" or "talk(ing) to LIFX." 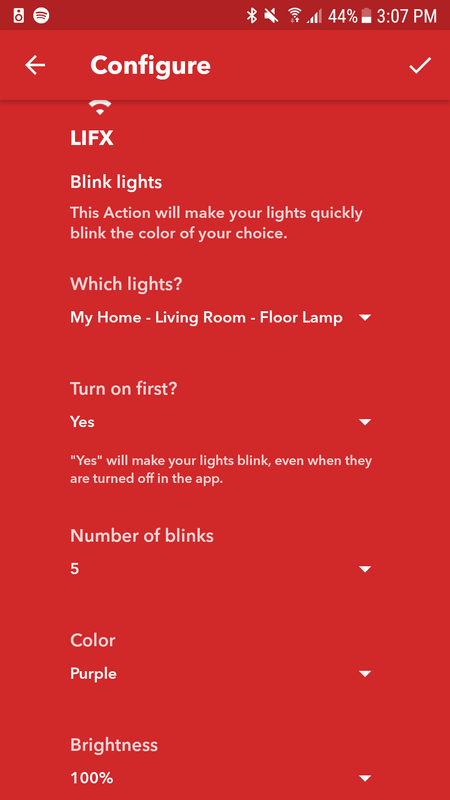 The process of adding it is detailed here, but it's pretty straightforward and the same as with any other smart home service. 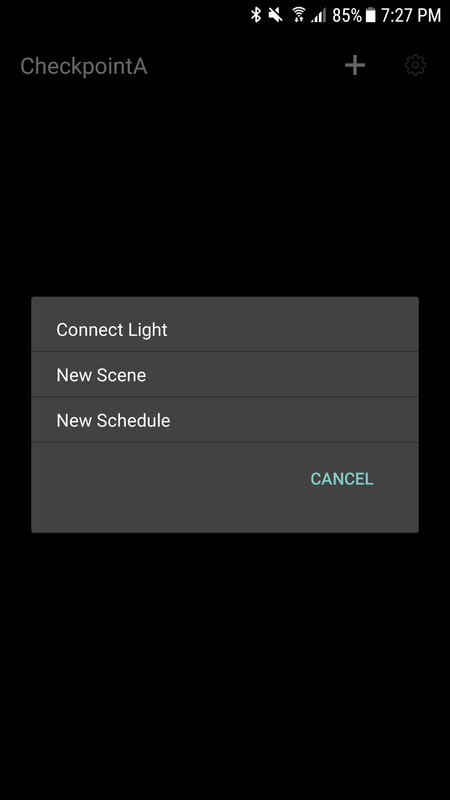 Through this integration, you can turn the lights/scenes on and off, dim or brighten lights, and set a specific color or brightness level. 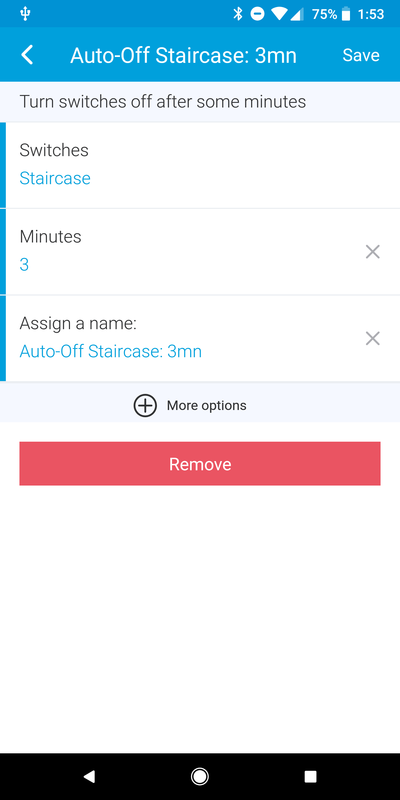 And in the Assistant, you'll be able to assign lights to different rooms and change their nicknames. 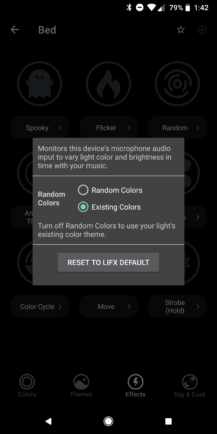 The second LIFX integration is indirect, and requires you authorize your account again through this link. With this one, you'll have to "talk to LIFX" or "ask LIFX," but it's mostly for moods so you can tell LIFX you're feeling happy or excited or cheerful. I often forget this option exists and just use the direct controls. 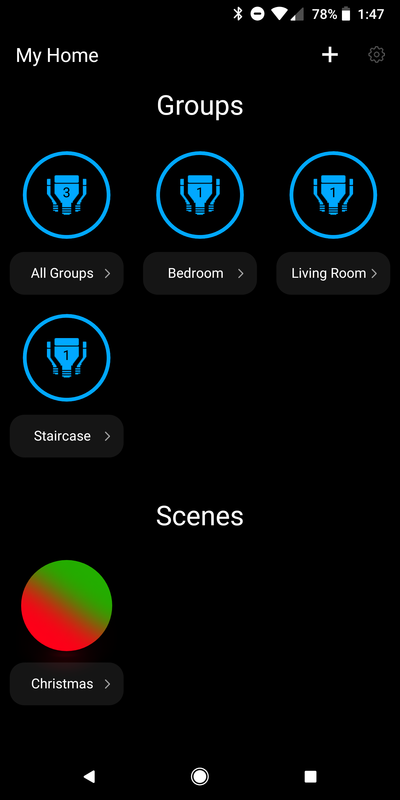 LIFX in the Home Control section (left) and the two different LIFX integrations in Assistant (right). LIFX has an IFTTT channel with plenty of actions (sadly no triggers), and I've used it to automate things that I couldn't do inside the LIFX SmartThings app. For example, blinking my lights when a Barcelona/Real Madrid game starts, or when new motion is detected outside the front door. 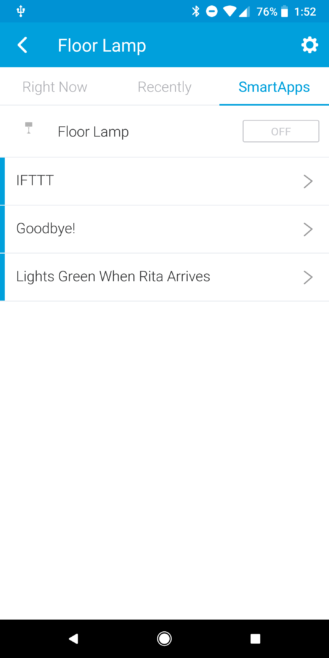 LIFX also has an advanced mode that lets you choose some very specific settings in IFTTT. 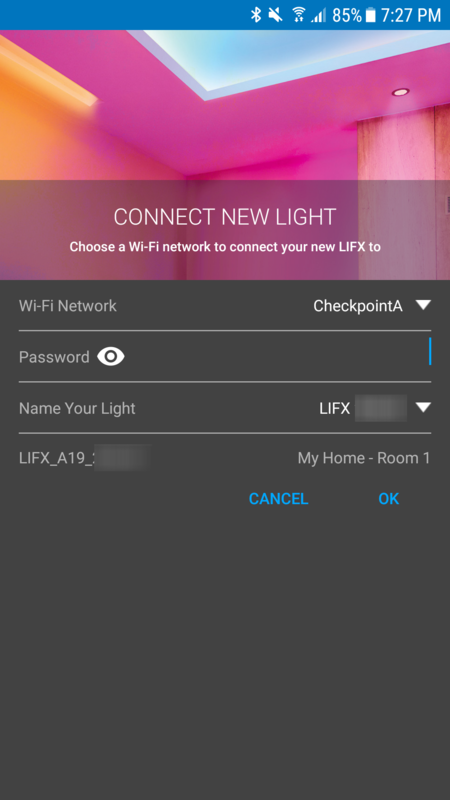 LIFX doesn't require a hub, but there's still some benefit in linking it with an existing compatible smart home hub. 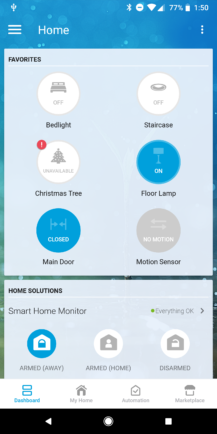 In our case, it provides central control for as many gadgets as possible, it saves my husband from having to install a separate app for each device I try and review and lets him rely on the SmartThings app for everything, and it makes automations with other sensors possible. 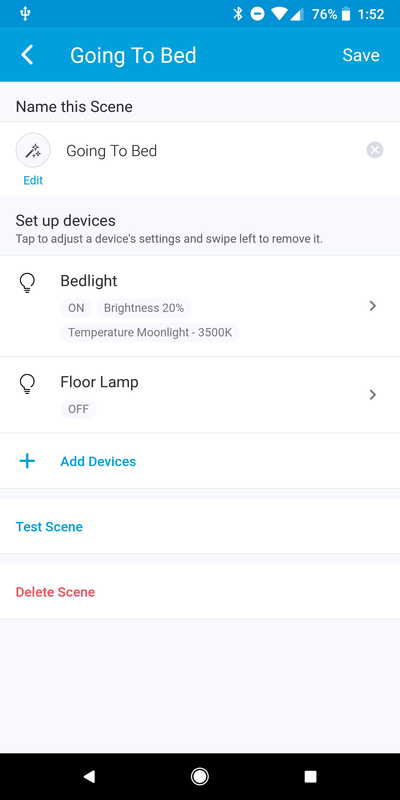 Adding LIFX to SmartThings was super easy and my three lights' color and state carries well over to the SmartThings app (except themes and animations). 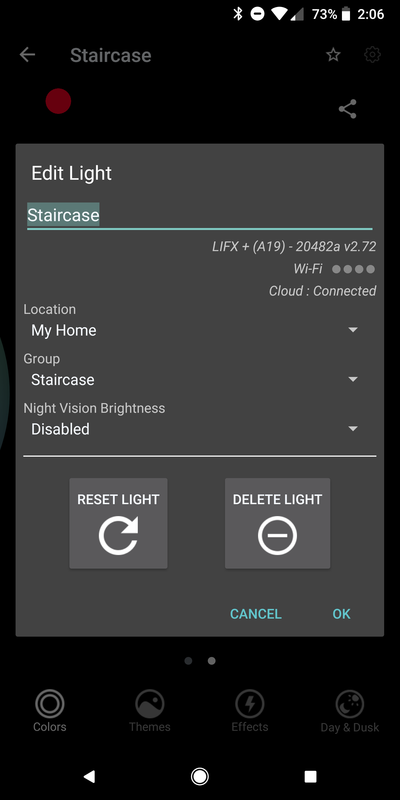 I can easily toggle any light and change its brightness and color. There's no wheel here, but the color selection covers a similar gamut to the LIFX app. 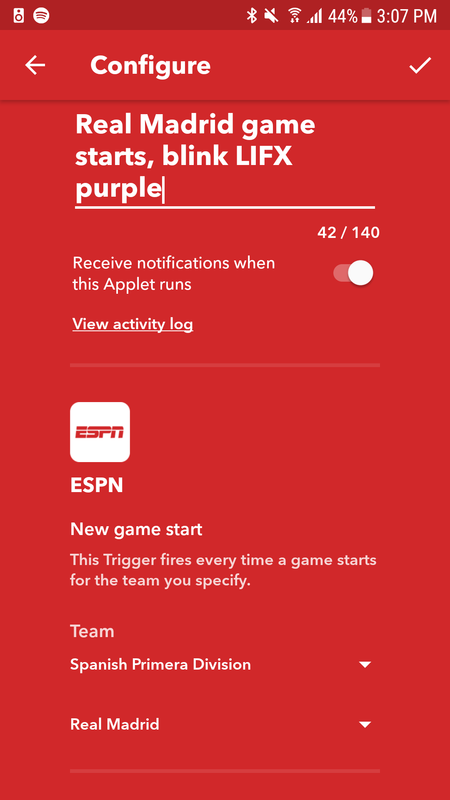 More handily, I can see a log of each state change for a light and link it to SmartApps (automations). In the screenshot below (right), my floor lamp turns off when I leave as part of the Goodbye! routine and turns green only when I arrive. Told you I like the color. I've also integrated the lights in SmartThings scenes. 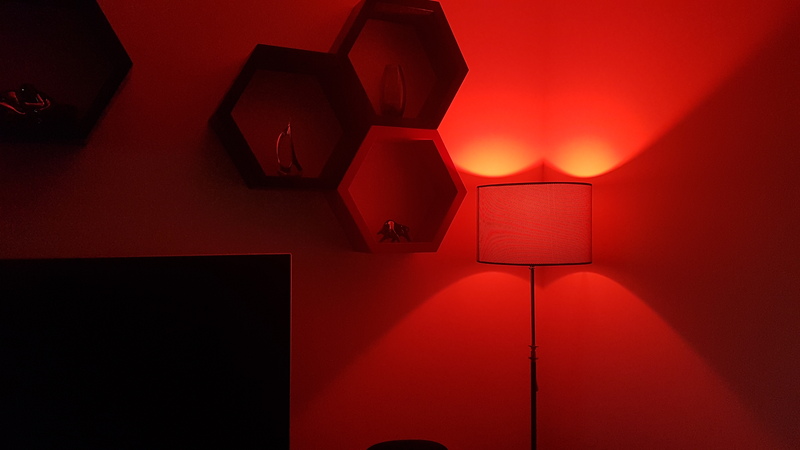 This is pretty much the same as LIFX's app scenes, but in this case you can see exactly what each light is doing, and you can link lights, plugs, and switches from multiple brands. 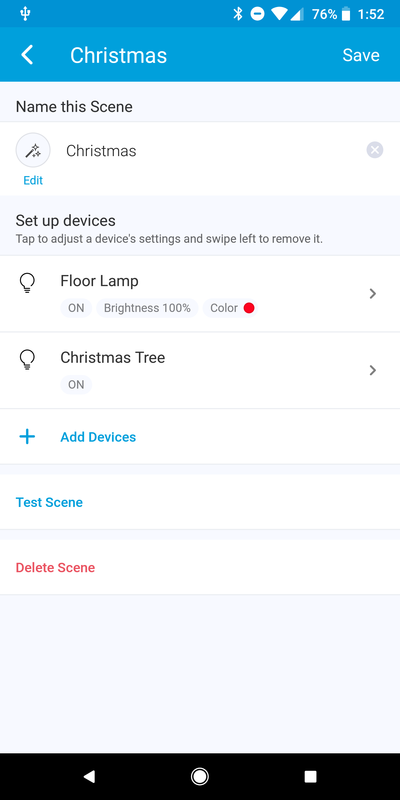 My Christmas tree is on a WeMo plug but it's in the same scene as the LIFX floor lamp. 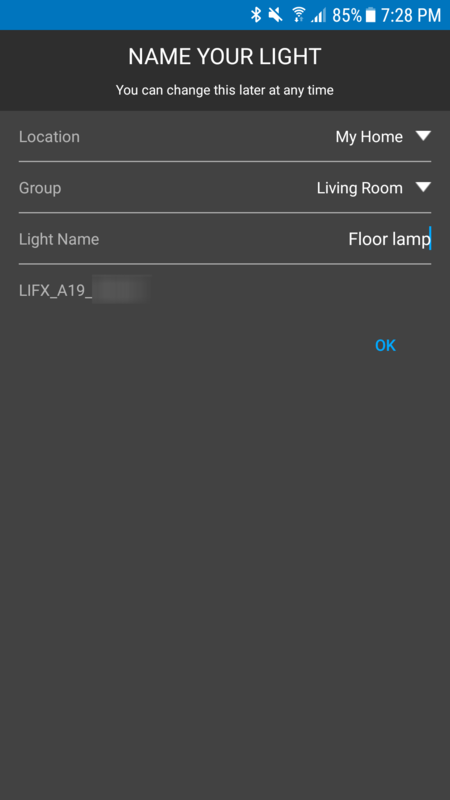 Finally, you remember how I said that there's no timer either in the LIFX app or in the SmartThings app? 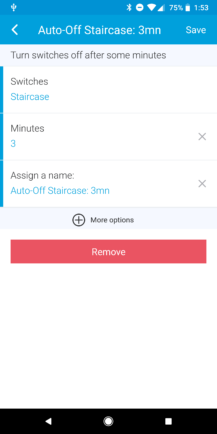 I had to learn about custom SmartApps and then use this code to add a timer-like feature. This allowed me to turn off the staircase/doorstep lamp after 3 minutes of it being on, regardless of when/how it turns on (motion or power cut). 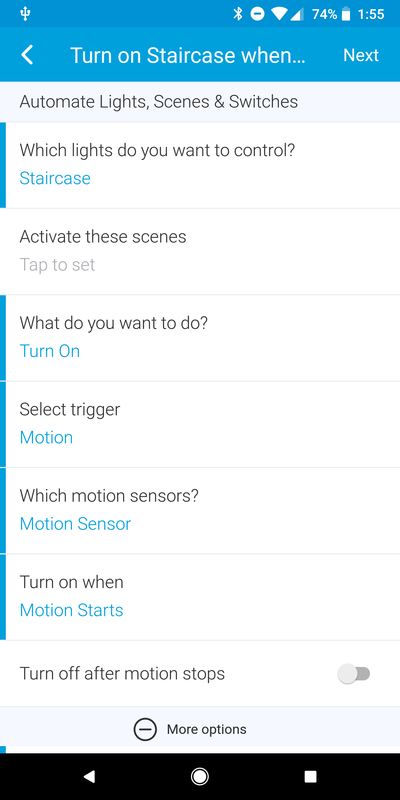 I also used the Smart Lighting SmartApp (it's built-in, no need for custom code) to trigger it to go on when my outdoor sensor detects motion. And to avoid needless power consumption after a power cut, I also set up an auto-off 2 minute timer for all lights when no one is home. Along with the 5% scheduled brightness at night, this ensures we're never disturbed by lights turning on each time the electricity cuts. It's a sad state of Lebanon that I have to account for crappy situations like this, but it's also even more disheartening that companies never take this kind of issue into account when designing their products. Not everyone has 24/7 electricity and this should be part of smart products' design consideration, just like low bandwidth. 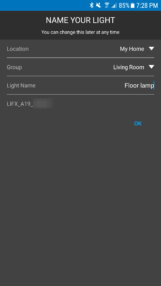 One of the simple joys of using these lights for us has been installing the LIFX+ just outside the door on our floor's landing and connecting it to a nearby motion detector in SmartThings. The moment we open the elevator door or walk up the stairs, the sensor sees movement and turns on the LIFX bulb, but it only does so from sunset to sunrise. It's a bit magical to have your way to your apartment door automatically lit when you land on your floor and it's even more handy when you're carrying things. Since this is a color lamp, I also have some fun and change the colors so expected visitors to our apartment are greeted cheerfully when they arrived. In this current setting however, I'd say the LIFX+ is a bit overkill, especially since there's no huge advantage with the night vision on or off given the obstructed view to my camera. 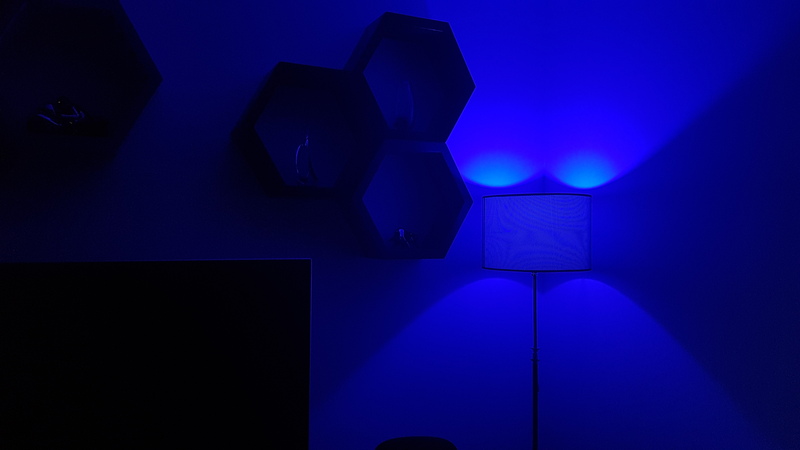 A LIFX Mini White would do the job for a third of the price and I may actually move the LIFX+ to another room soon and replace it with a Mini. The colors make a lot more sense in our living room. The corner floor lamp has been a source of many smiles over the past few months that we've had the LIFX light inside it. 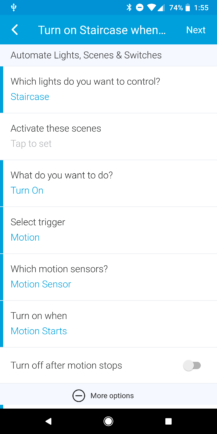 Whether we're controlling it with the app or the Google Home, or automating it through SmartThings or IFTTT, it's been a joy to just have it inject a new mood to the room with each change. Part of me wishes we had more individual lamps like this strewn across the room so we could have an entire theme play out, but one is still super nice. Guests to our house have been dumbfounded to see us ask Google Home to turn on or off the lamp, or set it to a new color. As time has passed, I've had fun setting up different automations and recipes for this lamp. It turns green when I arrive home so my husband knows I'm there even when I'm still parking my car and so I have a nice color greeting me when I open the door. 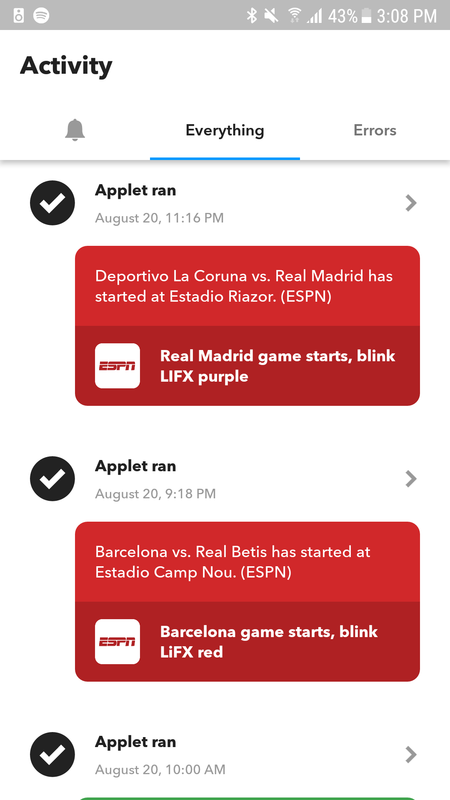 It flashes red when there's a Barcelona game starting, purple for Real Madrid games, and blue when there's motion outside so we know someone might be knocking on our door soon. 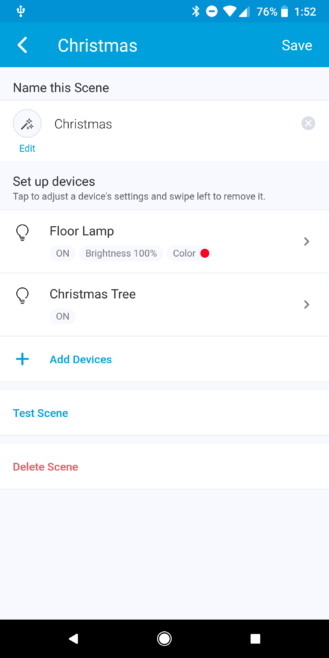 It's also part of the Christmas scene in my SmartThings that turns it red and turns on the Christmas tree's WeMo plug. And these are just the ones I remember off the top of my head. This isn't daylight streaming in from the window, it's the LIFX Z set to white lighting up the room. 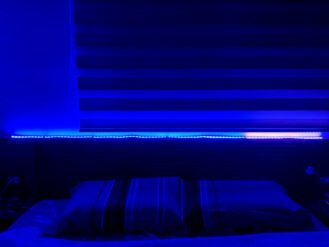 As for the LIFX Z, I feel that the strip is kind of wasted in our bedroom now, though the flashy club lights effect is fun, uhm, sometimes... 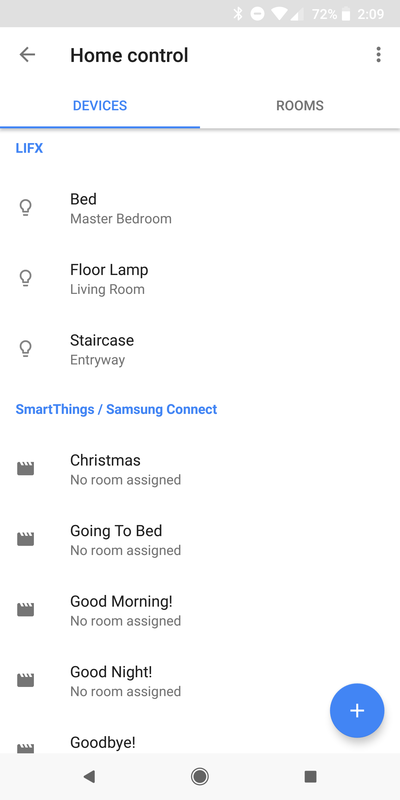 The best use I've found for it is telling Google Home in the hallway I'm going to bed and having it turn on the strip so the room is lit by the time I reach it. 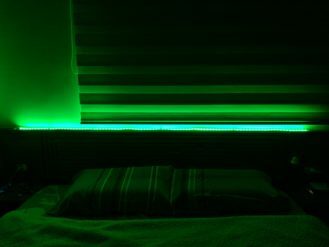 I can also issue voice commands to turn it on and off while still in bed, and change its colors. That's handy, but again, I feel the use case could better be served by a cheaper LIFX Mini light. I'm super excited to move it to the dining room home bar though, that'll definitely make it shine with its true purpose. The main downside I've found to LIFX, as mentioned in the table at the top, is the fact that it connects over WiFi. It's a plus when you don't want to worry about different smart home protocols and hubs, but it's a minus when your network is littered with dozens of devices and they disconnect from time to time. Sure, the daily power cuts put a strain on the connectivity, but I'm not the only to complain about LIFX lights sometimes not showing up in the app unless you power cycle them. 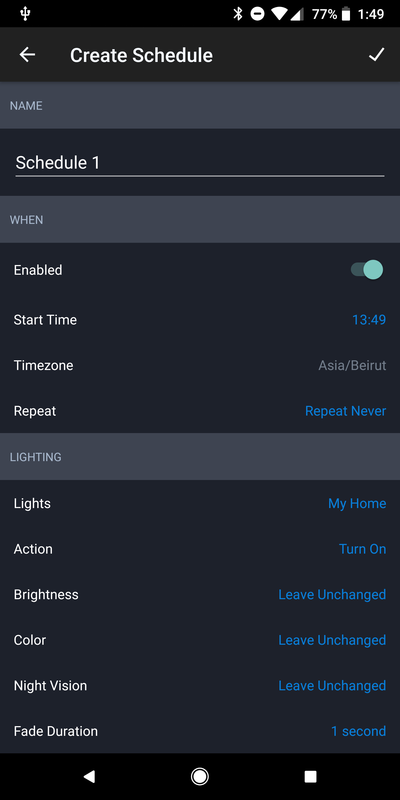 There are other things I wish LIFX had inside the app, like custom themes and effects, a timer (really, why not? ), and more intricate schedules especially for Day & Dusk, but the majority of the use cases are well served with the app and its different smart home integrations. 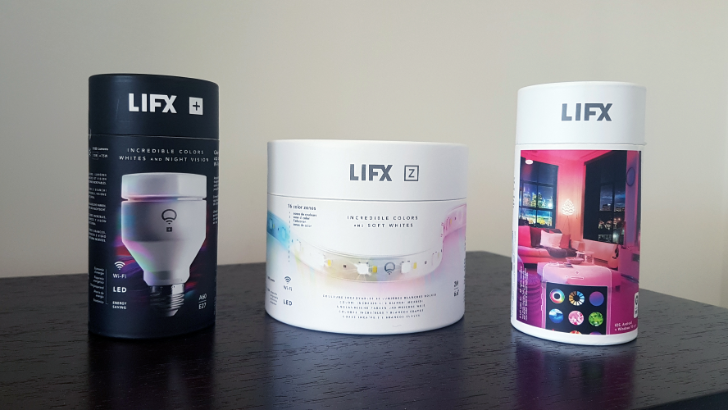 As with all smart products, the LIFX sticker price is shocking, but when you take into account the certifications required for each product and the continued support provided with firmware and app updates, it makes much more sense. For example, when I got the lights here, Day & Dusk wasn't an option. It was added later. I'd rather pay a little more upfront than have a monthly subscription to keep my light maker's servers alive and the employees' mouths fed. Right? 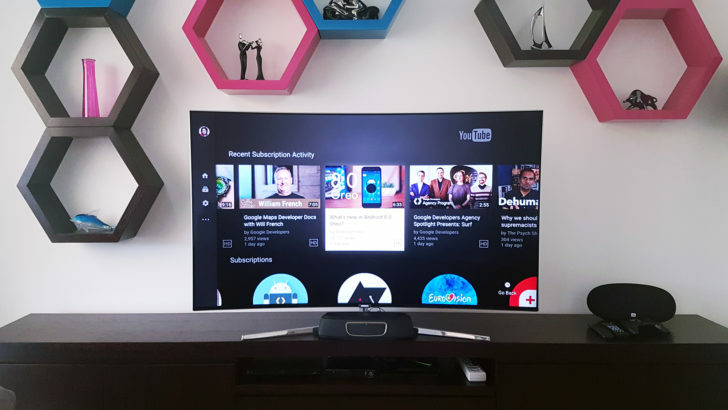 That said, there are three questions you may want to ask yourself if you've reached the end of this review and are considering LIFX. 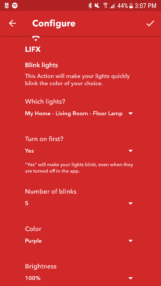 One is whether you should buy smart lights to begin with. And while I think they're superfluous, I love the control they give you over your house regardless of where you are and the convenience of voice commands and automations. Getting one or two lights isn't super expensive to dip your toes in, but more than that will require some budgeting and thought. At this point, I wouldn't invest hundreds of dollars in an entire house setup, so I'm more into mood lighting for smart bulbs instead of relying on them solely. I'm waiting for prices to become more affordable or for us to know for sure which protocols/companies are in it for the long haul before I go all in. 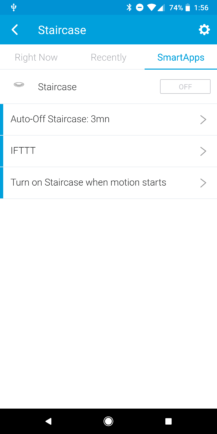 The second is whether you want smart switches or lights. In most situations, switches will be cheaper, but the choices outside of the US will be super annoying to navigate due to different sizes, voltages, and connectivity protocols. 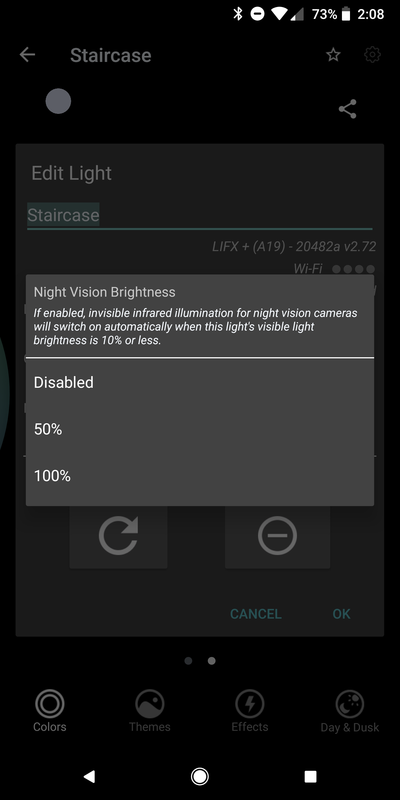 Switches also don't give you any color or night vision controls, sadly. 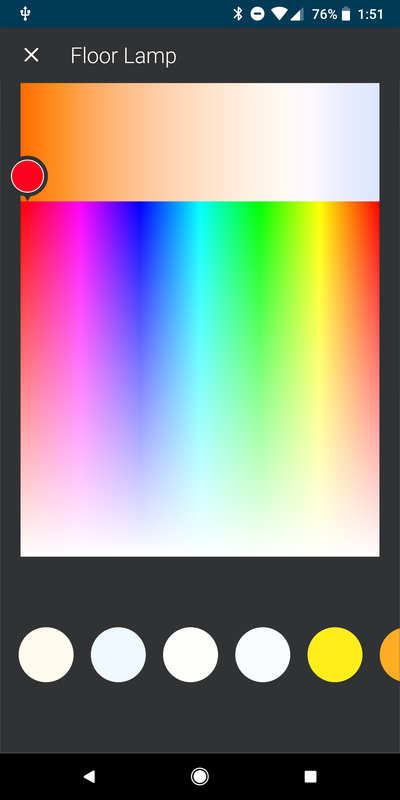 This color works well with my living room's quasi-CMYK setup. The third question is whether you should go for LIFX or Hue. That's a subjective choice. I haven't tested Hue so I can't give you an informed recommendation, but LIFX are often cited as brighter and more color vibrant/accurate. However, they might disconnect a bit more, they're more expensive, and they will show separately on your WiFi network. I'd say if you only want 1, 2, or even up to 5 lights, you're better off skipping the hub and going with LIFX. But if you want to deck your house with way more lights than that, Hue is a more logical choice, and LIFX Mini is only a distant second option. 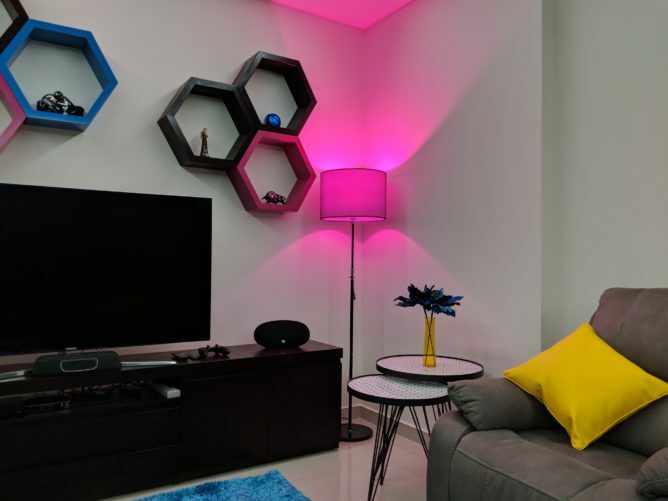 Hue is also compatible with way more products (Wink Hub for example) and feels like the safer future-proof choice in that context. 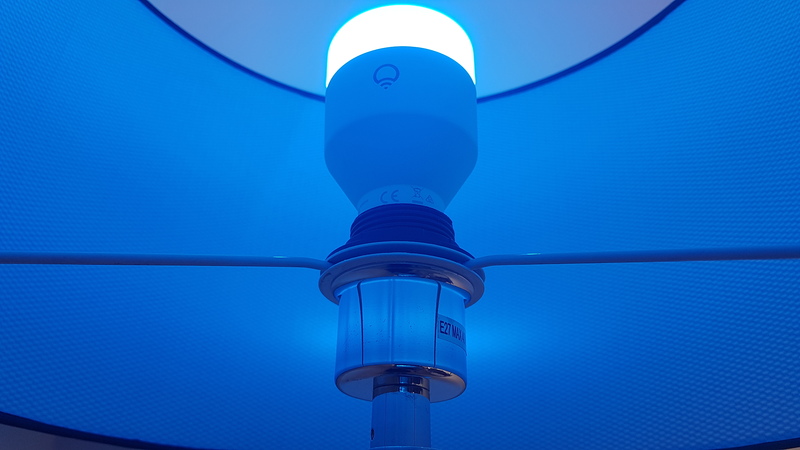 In case your answers lead to LIFX, the large A19/A60 bulb I reviewed here is bright, gorgeous, and works well as a standalone mood light, but it might be overkill in many situations that'd be better served with Minis. The LIFX+ is ideal for outdoor lights and situations where you need improved night vision IR. And the LIFX Z, like all LED strips, is beautifully decorative. 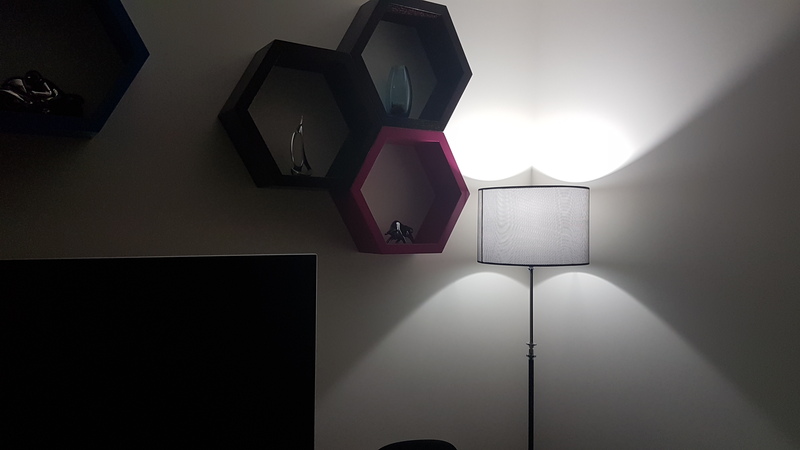 LIFX makes other types too, like BR30, downlights, GU10, and tiles (similar to Nanoleaf Aurora), so check those out too for more options.